While i started using ubuntu i need some basic tools like how much internet speed i’m getting now. That’s why i choose this Indicator. It is one of the best indicator i never used before. 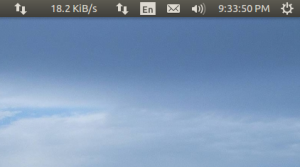 Netspeed is a simple Ubuntu Indicator. It displays the network speed on the Unity panel. Once installed, log out and log back in – Indicator Netspeed should start automatically after you log in.